Teaching piano involves some explanations, some demonstrations, and some evaluation. Today it included all of the above as well as some directed practice. The old adage says that “practice makes perfect.” Some say practice makes permanent, and perfection depends on how you practice. It’s true for playing the piano, and it’s true for thinking. Repetition of the wrong notes or the wrong timing makes it easy–natural– to play the passage wrong. In the same way, unhealthy or untrue thoughts become more and more entrenched as I rehearse them. Unhealthy and untrue beliefs follow quite naturally. My Teacher offers a better way- He speaks life. When habit dictates perfectionism, my teacher Jesus whispers, “Peace.” When fear of failure looms, He calls me beloved. Instead of “do, do, do,” He says, “Come.” And when I see years of practicing wrong and get discouraged, He reminds me that there is no condemnation in Him. You never know what you’ll find in a doctor’s office. 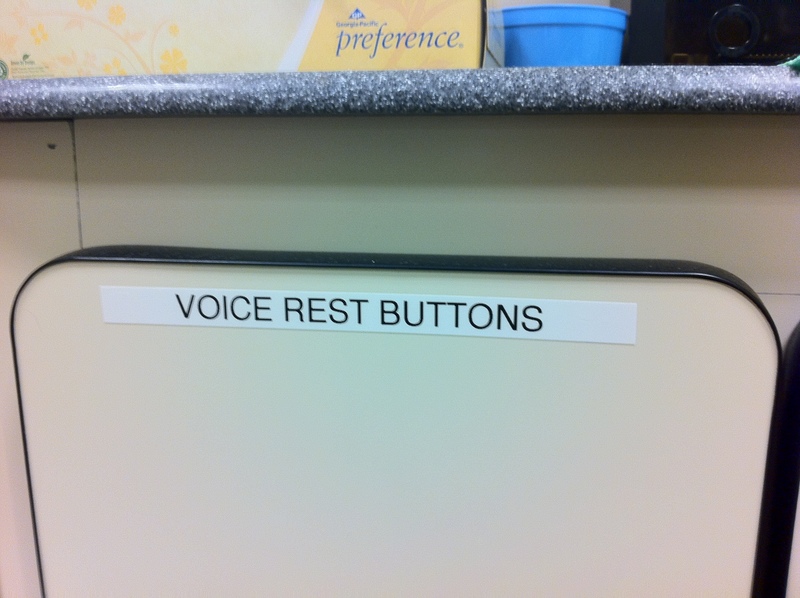 My visit to the otolaryngology clinic at UW yesterday led to the discovery of this labeled cabinet in the exam room. I didn’t get a button (thankfully!! ), but I did snag a picture while the doctors and speech pathologist were chatting about me somewhere else. You never know where God’s going to surprise you with a reminder that you’re not in control. It’s true; I can mentally acknowledge that I am completely dependent on God’s grace and provision for everything in life. Somehow, though, when it comes to not being able to do something I’m supposed to do, that restful dependence disappears and in its place comes the burden of self-decreed failure. I sat in the speech pathologist’s office as she told me to do things with my voice that I couldn’t do and she couldn’t teach me to do. About 7 minutes passed before I bursted into frustrated tears- frustrated that I couldn’t do what she wanted me to do and frustrated that my muscles tried to maintain my voice and just made things worse. There’s nothing quite like working really hard to do your best…and having your best be the opposite of what you should be doing. That’s where Jesus’ offer of perfect peace comes in. Isaiah 26:3 is clear in Laura Story’s song, “Perfect Peace.” Enjoy! For sunshine and 66 degrees, I am grateful. 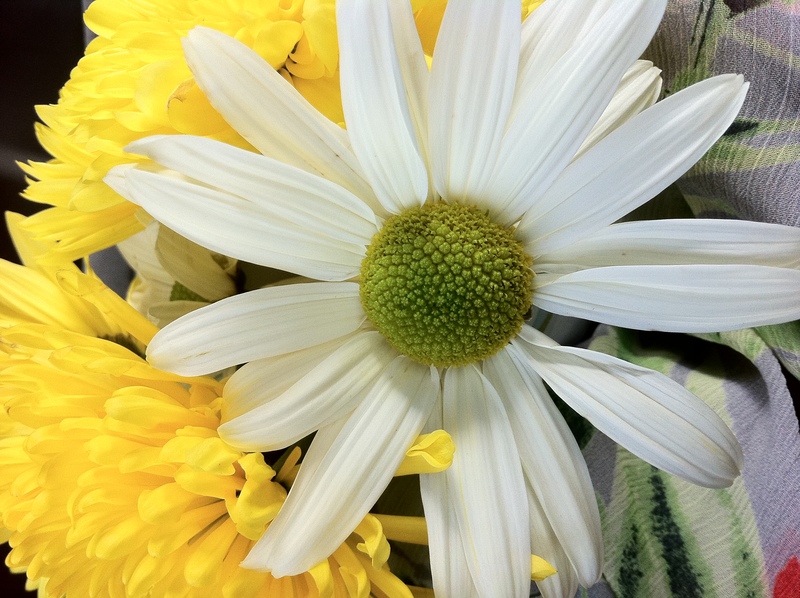 For peace in the midst of mystifying my doctor– losing my voice with beautiful vocal cord function– I give thanks. For a microphone that makes me look like an aerobics instructor or pop star, depending on who you ask, provided by the school district for my teaching amplification, I am glad. Because Jesus died but didn’t stay dead, I am alive, too. That makes everything else look like small potatoes. For a long time, my subconscious goal in life was to be textbook. Doing what was expected helped me to feel in control and secure. Sometime during college I learned that finding comfort in being conventional is not always the best way to live. In the meantime, I teach in a whisper, will do conferences with families tomorrow in a whisper, and learn to listen better. Yes, I know that whispering is bad for me. No, I don’t have the option of taking off everyday when I can’t talk- 15 days of school since December. My comfort is now in knowing Jesus knows the whole story. I may not be textbook, but He is the author of my life. That book works for me, even if it’s not normal! So…I’m voiceless again. This is the sixth time since last May and the third time in four months. My ENT is puzzled…as is my speech therapist…as are the rest of the people in my life who look at me with that “again? !” look. 🙂 Yes. Again. Now that I’ve tried lots of different ways to deal with this (everything from prayer, which continues, to steroids and speech therapy and more), it was time for a CT scan. I’d never had a CT scan before Wednesday. Generally speaking, new-to-me medical procedures don’t freak me out, but I was feeling a little anxious. Then I read Hebrews 2:15. Compared to death, a CT scan sounded positively wonderful! Despite the fact that Jesus did not have access to a CT scanner when He was on earth, I figured that His ability to overcome the devil and the fear of death more than qualified Him to take care of me and my anxiety about a CT scan. He did. I laid in the machine, holding still and breathing deeply and thinking with each breath: “Jesus is with me.” And He was. He’s been there for many days of ultra-quiet teaching in my classroom and been there for people with troubles much greater than hoarseness. Even if my anxiety is unnecessary, He is there. The author is discussing how believers and Jesus are all children of God. Jesus, as the Son of God, came to earth to share life with us but also to defeat death. That was all well and good- great, actually- but not necessarily new to me. It was the whole bit about freedom from the fear of death and the slavery. it’s really nice to know He’s still God. It was late for a morning run. That was ok because there was no school, just work, today. The verse on the treadmill has been and continues to be Ephesians 3:16-21, a perfectly fabulous stretch of text to meditate on and pray indiscriminately for the people in my life. All at once, the best thing I could ask God to give anyone was clear: that Christ would dwell in our hearts- that He would find a home in me. In you. With that, we will be rooted and grounded in love, we will know what we need to know, and we will be filled as only He can fill us. soft words whispered: Rest. It’s okay!